Gambusia affinis, called "mosquitofish" are one of the best treatments for mosquitoes. The mosquitofish feed on the mosquito larvae actively. 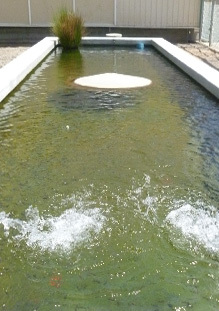 The District uses the fish for more permanent standing water sources such as ornamental ponds, unmaintained swimming pools, and animal water troughs. Mosquito fish do not lay eggs, but give birth to live young. They breed throughout the summer and new broods are produced at about six week intervals. The young, are about 1/4 inch in length when born and are ready to begin feeding immediately on mosquito larvae. Mosquito fish grow rapidly, and reach a maximum length of about three inches.